Today’s trigger was prompted by the huge posters promoting Black Swan. 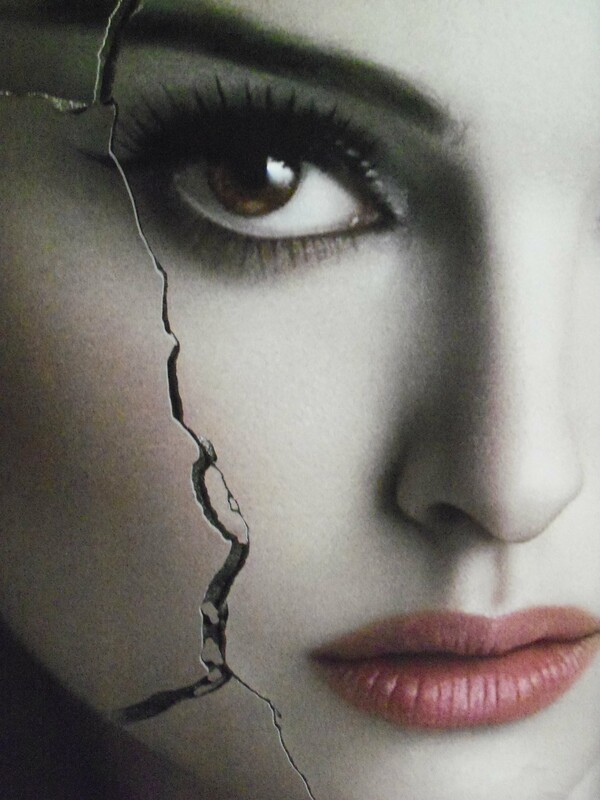 I love the crack – an outward manifestation of her breakdown. The posters are everywhere, and I’m looking forward to the movie that follows an ambitious ballerina who pushes herself to the brink. I’ve read someplace that most artists are a bit deranged, and their artistry is one way of trying to make sense of things. I leave that for you to decide. Writing of Janet Frame‘s death in 2004, Douglas Martin wrote in the New York Times: “Ms. Frame’s work used her own disturbing life to weave fictional nightmares that reflected, in her words, the ‘homelessness of self. '” I love that phrase… the homelessness of self. The back-story to Frame’s life is that after a suicide attempt, she spent eight years in New Zealand mental hospitals where she received 200 electroshock treatments. She was about to undergo a lobotomy when a hospital official read that she had won a literary prize. At which point, Frame was released. Frame herself warned of the “blurring of the fine distinction between the writer’s work and the writer’s life” and the naive tendency to read her fictional creations as autobiography. Perhaps you can fictionalize a near breakdown that you or someone you have known has experienced. Write a scene involving a mental hospital, the patient, and a visiting family member. Write a scene in which the person having the breakdown manifests an outward sign- certainly not a crack, but something physical. If someone knows the rules for plagiarism involving photography, I wish he would let me know. I’ve been hitting all the key photography exhibits in town, and my fingers itch to photograph the photographs. If I can take a photo without being caught, I do so – all the time waiting to be handcuffed for copyright infringement. I think I’m OK with the Natalie Portman poster above – it is, after all, a poster. But what about photographing photographs in a gallery space? If there is a sign “No photography allowed,” of course I don’t. But sometimes there is no sign. Is that my excuse when I stand before the judge? Will my excuse hold up in court? I’m thinking that pleading ignorance will hold little sway. I bought the book to accompany the Taylor Wessing Photographic Portrait Prize winners and runners-up at the National Gallery. And then I came home and photographed my favorite pictures in the book – am I less guilty for photographing pictures in a book that I paid for or equally guilty? I’m always struck by the fact that the jury’s choices are seldom mine. I wish I could sit in on the jury process and learn from the give and take of the jurors – what they see that I haven’t seen. On some level (aside from light, color, composition, and technique) I guess it comes down to the degree of the viewer’s emotional response. One of my favorites (photographed from the exhibition book that I bought) is this portrait of twins sitting astride a horse. 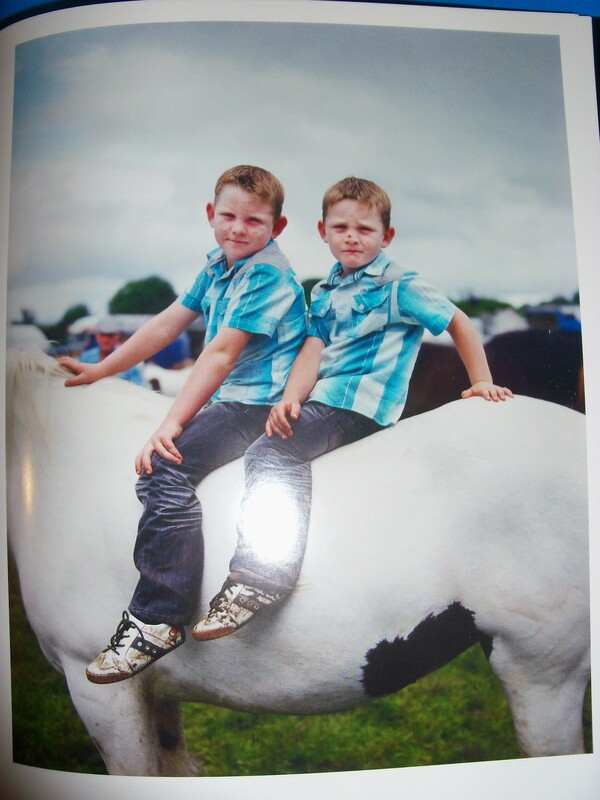 The picture was taken by Kenneth O’Halloran at Puck Fair, Ireland’s oldest stock show and sale. I love the way O’Hallaran cropped the picture. As for the emotional response, the picture took me back to more innocent days when our youngest daughters would come home from school, call the horses in from the pasture and ride off without bothering to saddle up. Their familiarity with their horses – their thighs in contact with the horse-flesh… the memory of it stirs me even now.